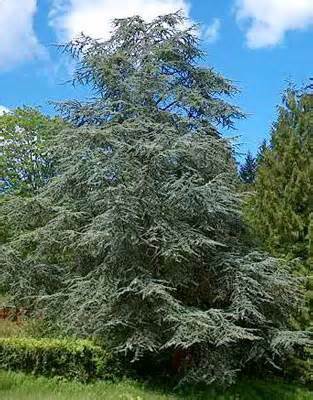 The Atlas Cedar is a distinctive, spectacular, eye catching evergreen conifer tree which has blue to bluish-green or light green foliage that are needle shaped. This tree, from the genus Cedrus, usually grows rapidly in its early stages of growth to a Pyramidal shape. However, upon maturity, it grows s slowly to become massive with horizontal spreading branches. It can grow to a height of approximately forty to sixty feet tall and can spread to about thirty to forty feet wide. The Atlas Cedar can live for many years. In addition, it requires a wide freely spaced area for its establishment and spread. It is best located in lawns away from sidewalks and streets to avoid pruning its branches. The tree has foliage that grow as clusters of needles and are arranged in whorls. The foliage clusters line the tree twigs giving it a fuzzy airy appearance. The blue conifer Atlas cedar's blue needle foliages resemble the color of a blue spruce and usually retain these foliage throughout the year. However, the foliages turn vivid glaucous blue as it ages. The tree becomes flat topped upon maturity. The Atlas Cedar tree has both male and female cones. The male cones usually form on the lower parts of the tree, growing to a height of about two to three inches long. Its female cones are larger than the male cones and are green in color. They usually establish on top branches of the tree and can take up to two years to ripen. A ripe, Atlas Cedar, female cone is usually brown in color. The tree does not produce flowers. The tree can do well in full sun and in various well drained soil conditions. In addition, it requires soils that are rich in organic matter. However, it is important to note that this tree can not do well in heavy soils which limit their root growth. They cannot be planted in containers due to their deep roots. The Atlas Cedar tree is drought tolerant.